I never thought I’d be a fan of online business accounting apps, but with each new iteration of QuickBooks Online and its related set of apps, I’ve become a true believer. QuickBooks Online has had good iOS apps for accessing your QuickBooks Online data and now they’ve released the QuickBooks app for Mac, a free tool that brings your QuickBooks Online account to an app on your Mac. QuickBooks app for Mac provides app-based access to your your Web-based QuickBooks Online data. QuickBooks app for Mac should not be confused with QuickBooks for Mac 2014—it’s not a standalone application, and thus, requires that you already have an existing or plan to setup a new QuickBooks Online account, which is $13 to $40 per month. QuickBooks app provides a Mac-based frontend to the QuickBooks Online Web backend, something you would normally access using a Web browser. This brings up an important note about QuickBooks app for Mac: At present it requires an active Internet connection. No Internet, no access to your data, although Intuit states that future versions of the app will allow you to work offline and sync changes to the Web once you’re connected again. Forms customization in QuickBooks app for Mac is smart, easy to use, and lets you create beautiful forms. If you’ve used QuickBooks Online’s new interface, which rolled out to many QuickBooks Online users a month ago, the QuickBooks app for Mac interface will look familiar. 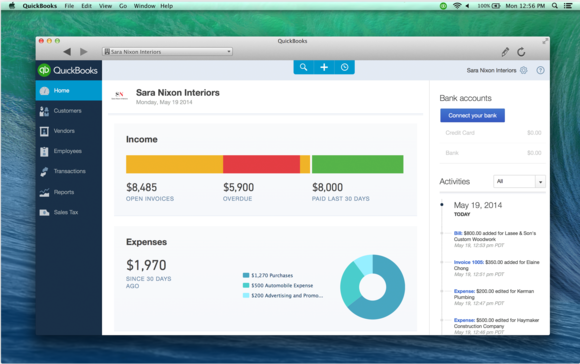 QuickBooks app for Mac is a doppelgänger to QuickBooks Online’s new, less austere, graphically beautiful, and easy to master user interface. The app’s sidebar offers one-click access to QuickBooks Online’s accounting and business management tools. The app’s Home button provides a company overview that displays information on open, overdue, and recently paid invoices, current P&L and expenses. Displayed at the right of the screen is a list of all your accounts, their current balances and a number indicating how many unreconciled transactions each has. Clicking anything you see on the Home screen takes you to the list of transactions associated with the item you’ve clicked. So, clicking the Overdue invoices link in the bar graph at the top of the QuickBooks app for Mac Home screen displays a list of all overdue transactions, where you can then select transactions and email the customers or print and send statements. One of QuickBooks app for Mac’s outstanding features is forms customization (a feature also available in the new Web app). Forms have traditionally been a weak point in most every accounting application, whether on the Mac, PC, or the Web. Beautiful invoices were only possible with apps such as Marketcircle’s Billings Pro. QuickBooks app for Mac offers four very nice looking form templates that you can easily make changes to. Colors and font sizes are easily manipulated, although at present you only have access to two fonts. 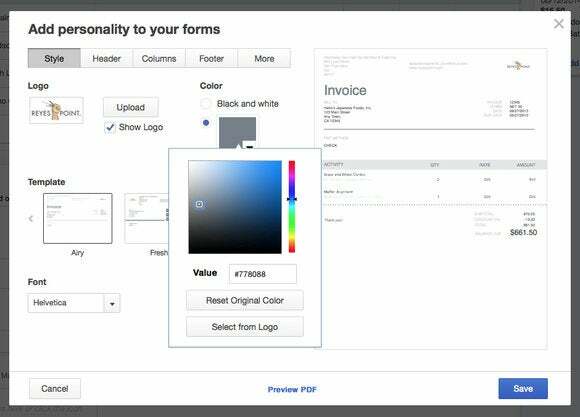 Also, upload your logo and the form is changed to reflect a color compatible with the dominant color in you logo. 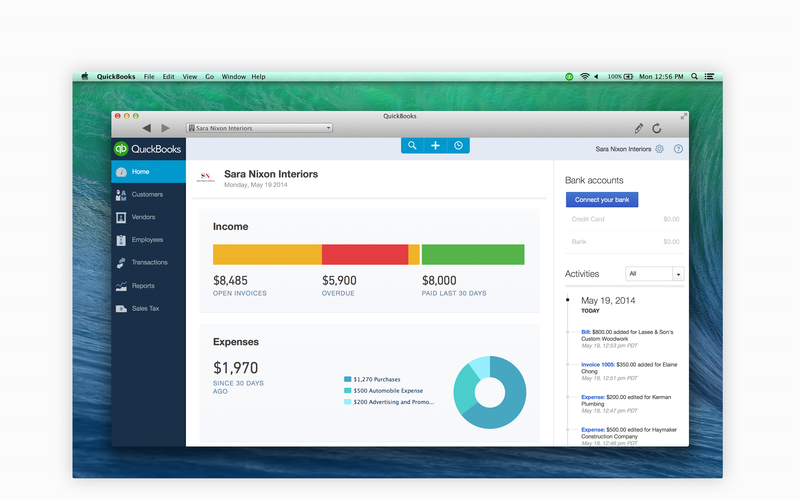 QuickBooks app for Mac give you an instant overview of your financial status. 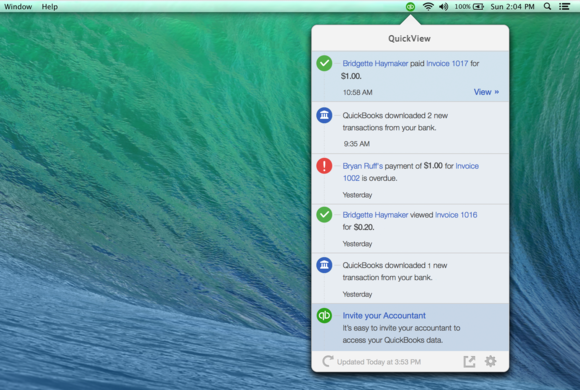 A couple of notes regarding some of QuickBooks app for Mac’s features. First, if you’re a current user of QuickBooks Online, some of the features mentioned in this review, such as forms customization, may not be available to you yet. This is also true of the app’s QuickView menu. QuickView is a menu extra that keeps you up-to-date on your business’ status without requiring that the app be open. At the time of this review Inuit was still testing this feature and, for some users, it may not appear as an option. While part of the promise of the QuickBooks app for Mac is speed, in my testing, once the app was open, I saw no noticeable difference between the desktop and Web apps. The only real difference is how quickly the app opens and initially displays data. The Mac app is quite snappy, the Web app, not so much. But, to my mind, speed is not the app’s chief advantage. The advantage is the familiarity of using a Mac application rather than a browser-based a Web app. There are no bookmarks to save, there are no “favorite browser” compatibility issues you may encounter, you simply open the app and log in, as you do with any other Mac app. QuickBooks app for Mac also has some minor annoyances, which are shared by the online app as well. Namely, Intuit persistently shills for QuickBooks Online features you haven’t yet “upgraded” to. You always see “to-do” items for setting up payroll services or links to set up Intuit’s credit card payment service. It’s not possible in either of these instances to hide these “offer” reminders. And, there is still no way to passively collect time billing information using a Mac or iOS app. The QuickView Menu lets you see important business information without requiring you to log in to QuickBooks Online. QuickBooks app for Mac is an excellent tool for managing your QuickBooks Online data using an app on your Mac rather than an app within a Web browser. While it offers nothing new in terms of features, the simplicity of using a Mac app rather than a Web app and the QuickView menu’s ability to provide up-to-date business information without requiring you to log in to your QuickBooks Online account make QuickBooks app for Mac an excellent addition to what is already a very good business accounting application.